RESTON, VA, December 11, 2017 – Wharton Club of DC and Leads Council Member, Jeff Adler, W'84, served as “Professor for a Day” for three of Professor Jehoshua Eliashberg’s classes on October 2, 2017. Jeff was a student in several of Eliashberg’s classes, graduating in 1984. Jeff’s son, Jacob, studied under Professor Eliashberg more recently, and will graduate in 2018. Jeff delivered two presentations to each class – one on “Considerations for Outsourcing MR and Consultant/Client Interactions” and one on “Cutting Edge Techniques to Sharpen Your Association’s Research.” The second lecture was a reprise of a presentation Jeff gave at the 2017 Annual Conference of the American Society of Association Executives. 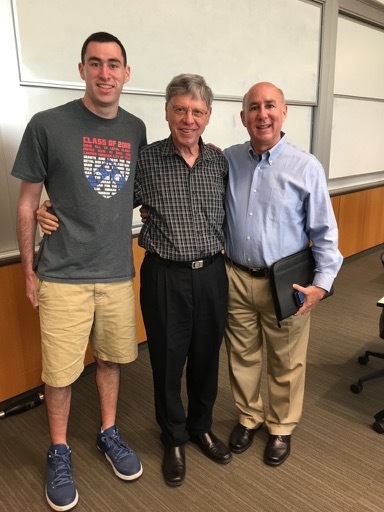 Jeff lectured to a mixture of Wharton undergraduate and graduate students taking Professor Eliashberg’s Data and Analysis for Marketing Decisions classes and his Models for Marketing Strategy class. Both presentations are available to Wharton Club members upon request. Those interested in viewing the presentation (at no charge) can contact Jeffrey Adler at JAdler@vaultconsulting.com. Mr. Adler is Managing Directory, Primary market Research of Vault Consulting, and a Wharton alumnus. He is an active member of the Wharton Club of DC and the Club's Leads Council, and the liaison to the NY and other area Leads Councils. Vault Consulting, LLC (previously part of Veris Consulting and Johnson Lambert & Co., a regional CPA firm) has been in business for over 30 years. We serve over 100 nonprofit organizations, and provide more than 40 organizations with primary and secondary market research on a regular basis. As a testament to the outstanding service we provide our clients, over 90% of the organizations we served 20 years ago are still clients today. The operations of Vault have grown since our formation, and today consist of technology-based survey research services, primary marketing research services, outsourced internal auditing and accounting, and information technology consulting. In early 2014 Veris acquired the Primary Marketing Research practice of Centrac DC, LLC, led by Jeffrey Adler, who has over 30 years of experience in the area of market research and is a renowned expert in his area of practice. The addition of Centrac DC’s seasoned team of experts broadens Vault’s suite of survey research services to include a full spectrum of customized primary market research services, including quantitative and qualitative survey research services applied to areas such as product testing, company, brand, or new product positioning, customer satisfaction, advertising research and trademark litigation.